Baby Yoliswa’s Story as told by our partner: “Baby Yoliswa arrived after being found abandoned outside a clinic in a community in South Africa. Baby Yoliswa was estimated to be 5 days old when she was found. Her umbilical cord is still attached. She was found by a clinic nurse outside their offices who telephone a social worker from the local Welfare Department. The social worker then called the offices to enquire if we had room to accept this new baby girl. 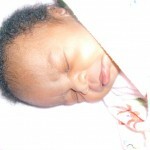 Since we had just facilitated the adoption of 2 babies we did have space and little Yoliswa arrived Wednesday night. She is beautiful!! Given her age, she has not yet had a full set of medicals (including an HIV test) but this will be arranged in the next few weeks. In the meantime, she is being showered with love and affection. The volunteers are a great help and she is being cuddled and loved. She is also receiving the BEST form or nutrition in the form or breast milk which is being supplied by donor moms through the breast milk bank. - WAR, Int'l agreed to support this baby until adoption thanks to our donors and their blessings of this program.